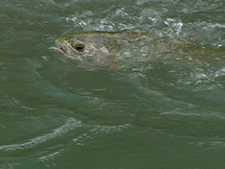 Tim visits south Texas to fish the country’s southernmost trout fishery. He fishes with Scott Graham, a member of the Guadalupe Chapter of Trout Unlimited (GRTU) and owner of the Guadalupe River and Beyond Guide Service, for rainbow and brown trout. Tim learns about the chapter’s successes in influencing flows from the Canyon Dam to support this unique tailwater, and how GRTU’s leasing programs increase catch-and-release fishing access to this predominately private river. To say that I was surprised to learn that just south of Austin, Texas, there’s as fine a tailwater fishery as you’ll find anywhere in the country is a bit of an understatement. But the Guadalupe River is just that. Picturesque and lush, the river’s banks are lined with sycamore trees and thick vegetation, straight out of a rainforest. Its dark holes and riffles are full of healthy, hard fighting rainbows and browns, some of which exceed 3-4 pounds. The Guadalupe River flows east through the rugged limestone hill country north of San Antonio until it reaches the scenic waters of the Canyon Lake reservoir. In this 8,240-acre lake the river’s waters cool and sink to the bottom. After the dam, where the chilled water is discharged from beneath the reservoir, the river jogs south toward the Gulf of Mexico and for the next 15 miles supports the nation’s southernmost trout fishery. The problem with the Guadalupe has been determining how much of this water gets released, and for what purpose. The river supports a diverse group of stakeholders, from endangered species and a strong recreation and tourism industry, to irrigators and the development-focused Guadalupe-Blanco River Authority (GBRA). Release volumes also determine the quality of trout habitat. When many interests compete for a limited resource, habitat quality often becomes a low political priority, so environmental organizations have initiated efforts to keep the Guadalupe’s health at the top of the list. Among these organizations, TU’s Guadalupe River Chapter (GRTU) has been instrumental in securing agreements with the GBRA to ensure that spring and summer flows from the reservoir are adequate to support the trout fishery. GRTU is also working closely with the San Marcos River Foundation in its bid to acquire a water rights permit guaranteeing flows to sustain the entire river’s ecosystem, from the Canyon Dam to the estuaries of the San Antonio Bay. Ironically, an excess of water rather than a lack of it recently damaged the river. In July 2002, after six days of storms dumped 36 inches of rain into the reservoir, a seven-foot-tall wall of 85-degree surface water crested the spillway, flooding the tailwater and devastating the best trout habitat. With so much water of such high temperature entering the fishery from the reservoir’s surface, few trout were expected to survive, and the heavy silts left by the floodwaters will not help the fishery recover. The river is currently closed to recreational use, but there may be a silver lining. 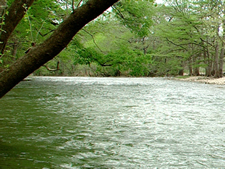 Through emergency federal reclamation of property damaged by the flood, more public access to the river may be created, relieving a critical shortage that had limited angler exposure to this unique Texas fishery. The Guadalupe tailwater is known for abundant insect hatches supported by its alkaline, limestone bottom. Flood-carved grooves cut deep in this solid substrate provide cover for the river’s rainbow and brown trout. While hatches of caddis and smaller mayflies are prolific, nymphing is especially effective on the Guadalupe. Standard patterns like pheasant tails, midge pupa and prince nymphs work well. Most of the river is private property, although access is possible at the Canyon Dam and other public points. Guadalupe TU runs a lease program with various landowners to provide access for chapter members and their guests, and for the public in some places (for a fee). While wading is safe, felt sole wading boots with studs or spikes and a wading staff are recommended. Water levels can rise rapidly, so watch your step and check release data with the Army Corps of Engineers (800-965-3342) before you go.